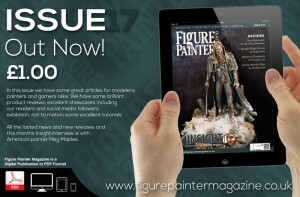 Figure Painter has released issue 17 of their magazine for your downloading and reading pleasure. Welcome to Figure Painter Magazine issue 17. In this issue we have some great articles for modelers, painters and gamers alike. We have a special article where Marko, our terrain guru, shows you have to make a hilltop gaming table. Justin McCoy brings us the second part of his superbly modelled and painted Oldsmobile 442. Martyn Dorey also begins a painting challenge with your truly where we both have to paint the 54mm display base we built in a previous issue. Also in this issue we have some brilliant product reviews, excellent showcases including our readers and social media followers exhibition. All the lasted news and new releases as well as a very informative look at some of the brushes that are available, plus lots more; but we kick off with a brilliant Insight Interview with American painter Meg Maples. Don't forget you can also win a free display plinth every month by posting pictures of your painted miniatures on our facebook page and getting the most likes in a month.